Deja View Photography: Planning a Wedding in Port Townsend? Visit the Fort Worden Expo Show on March 1st from 11-3. Planning a Wedding in Port Townsend? Visit the Fort Worden Expo Show on March 1st from 11-3. This poster was created by the folks at Fort Worden who are organizing the 2014 Wedding Expo to be held this Saturday, March 1st at the Commons. I did not take these images and do not see any photo credit on the poster. 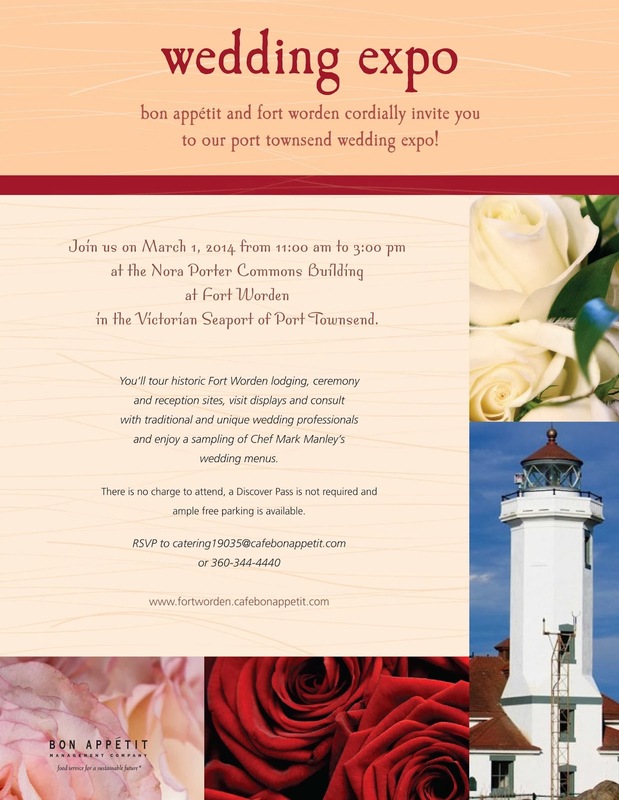 This is the second year for the Fort to hold this event and I think they plan to have over 30 Wedding vendors including, Port Townsend florist like Holly's Fine Flowers, Willow Wind Farm and Gardens plus Petals Flower Shop. Cake and bakery vendors include Safeway, It Takes The Cakes, Sweet Laurette's Cafe and Seashell Cakes. Port Townsend Wedding planner Karle Coppenrath who owns Weddings by Design will be there to answer questions about her services. Daily Pottery Bird another local business will also have a display. There will be several local musicians, wedding officiants and Posh Hair Salon just to mention a few of the local businesses in attendance from 11-3 at the Commons Building at the Fort. Admission is free as is parking so no need for a Discovery Pass if interested in attending the show. This will be the second year I have attending displaying images from my photography business, Deja View Photography. I'm excited about sharing some of the beautiful custom wedding albums I have designed as well as lots of new products I will be offering my clients this year. Stop by my display and enter to win a one year subscription to Martha Stewart Weddings.